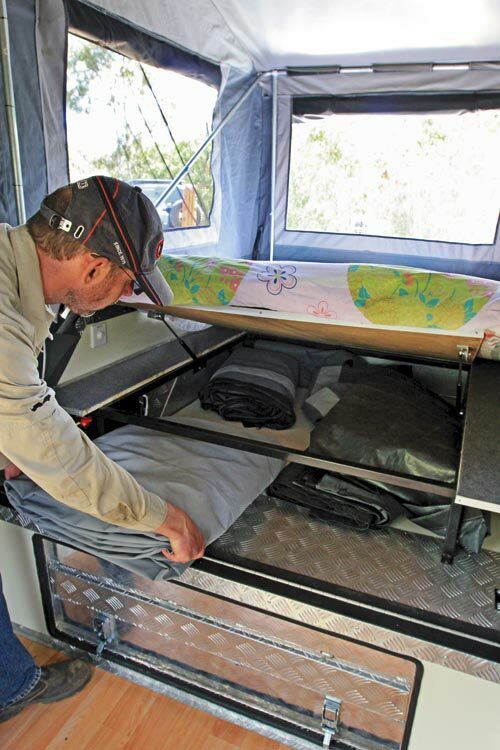 Like it or not, finances — or lack thereof — are usually the biggest limitation when purchasing an entry-level camper trailer. Buyers want value, represented by well-made product at an attractive price point. 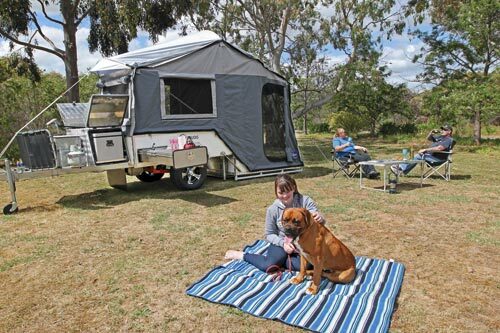 Eagle Trailers and Campers (T&Cs) from Adelaide has been answering that call for the past four years with a seven model line-up covering hard and softfloor campers. 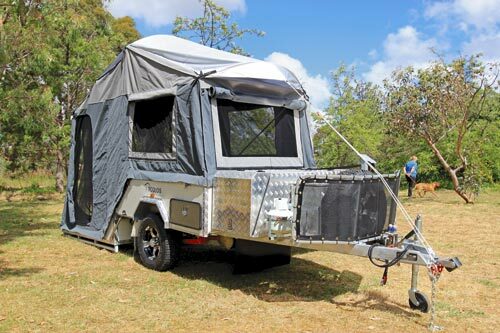 The Iroquois is the entry-level hardfloor camper in the range, priced at $14,800. From the kerbside, the Iroquois is well presented with white duco, understated blue graphics, polished alloy wheels with black highlights and checkerplate and stainless steel trimmings. Dual tone grey canvas complements the paintwork. 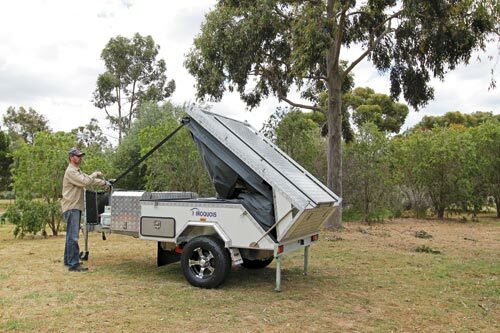 The foundation of the trailer is a substantial hot dipped galvanised chassis measuring 100x50x4mm at the drawbar and 50x50x4mm at the chassis members. 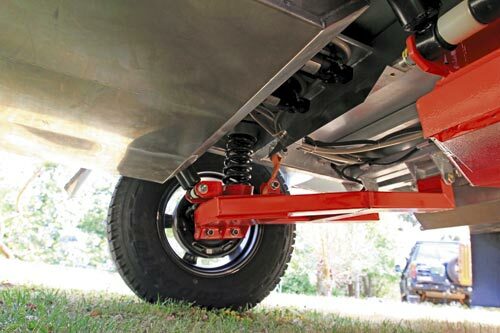 Independent suspension is equal to the task with big beefy red swing arms, coil suspension and dual shockers per wheel. The 10in electric drum brakes take care of stopping duties, aided by 15in alloy wheels wrapped in all-terrain rubber. 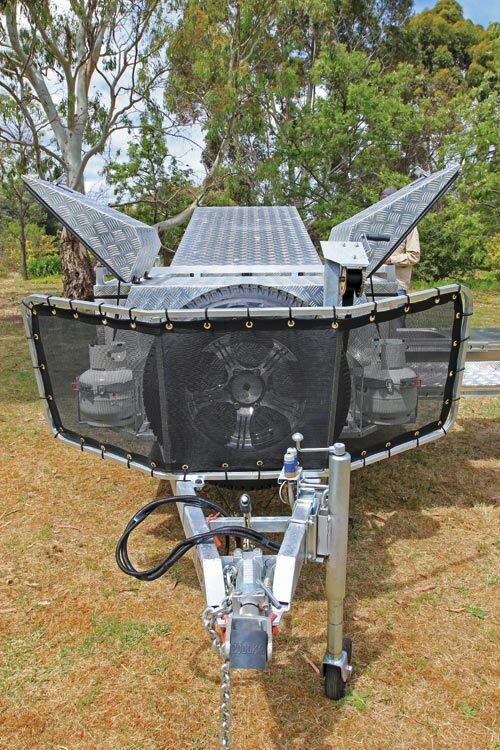 One of the surprises is the dual stainless steel water tanks and twin 12V pressure pumps. A smaller 60L tank is mounted forward of the axle, protected by a large rubber stoneguard. 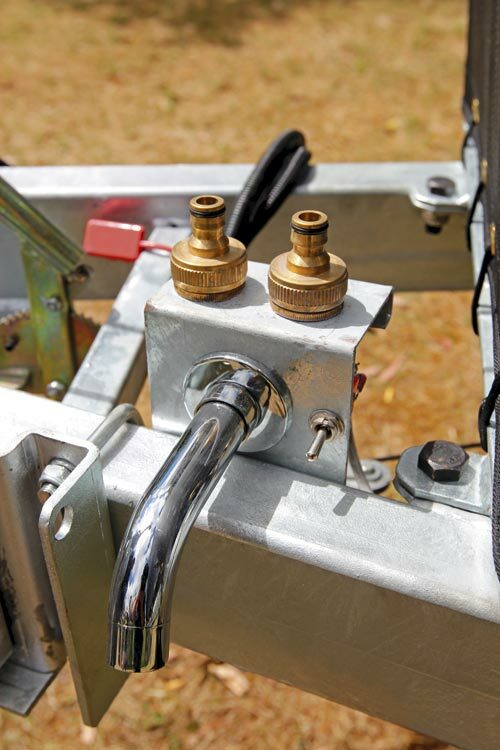 It feeds a tap on the drawbar; just click a switch to fill a bucket or wash your hands — very convenient! 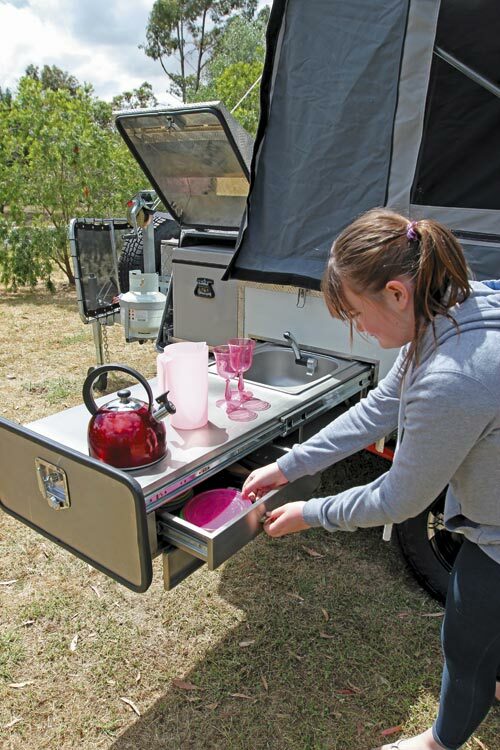 The rear-mounted 110L unit is plumbed to the kitchen and features an emergency valve to access water if the pump fails. Fast-fill valves with dust covers are mounted on the drawbar for both tanks and the pumps are well shielded from road debris. 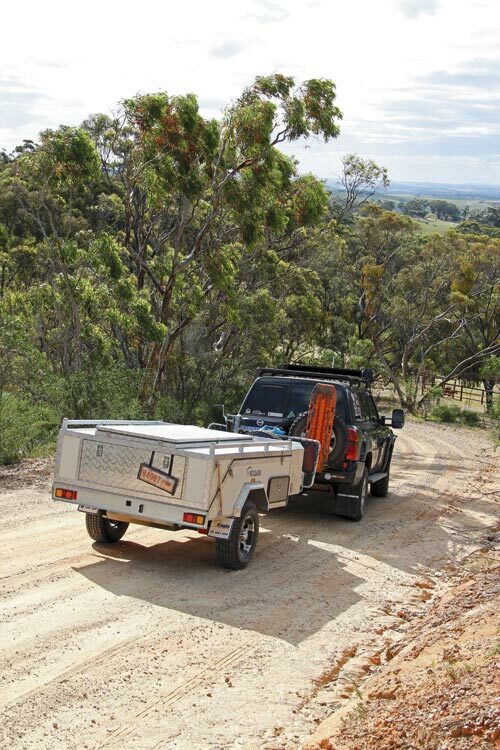 Up front, a simple poly block coupling provides good articulation offroad and a handbrake secures the trailer at the campsite, aided by the rear stabilisers. It is good to see rated shackles and chains in use. Also up front, you will find a swing-up jockey wheel, large stoneguard, twin jerry can holders, spare alloy wheel, twin gas bottle rings and a single gas bottle and regulator. Three alloy checkerplate boxes swallow plenty of gear, with each featuring automotive seals on the doors to keep dust out. 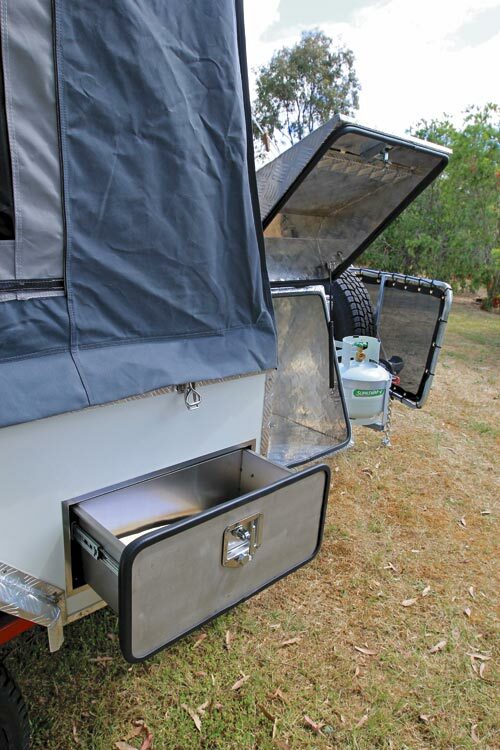 Gullwing doors on the two main boxes allow a low entry height; a fridge slide accommodates an optional fridge on the kitchen side although there is no lockout fixture to keep the slide open if the camper is on a slight angle. Ideally the fridge box would have an air filter to help the fridge breathe in hot weather without sucking in dust, but there has to be some concessions to keep the entry price sharp. The storage box on the driver’s side will accommodate a generator or other gear. Daylight was visible through the joins that were not evident in the other boxes, although I’d be sealing all joins to ensure a moisture and dust-proof environment. Still on the driver’s side, a small external cupboard provides some additional storage while a checkerplate locker on the roof hides the annexe poles and pegs. 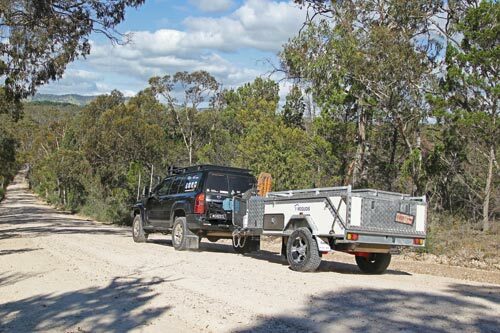 At the rear of the camper, LED running lights provide a long service life and a 50mm2 tow bar sleeve is ready for a bike rack or recovery hitch. 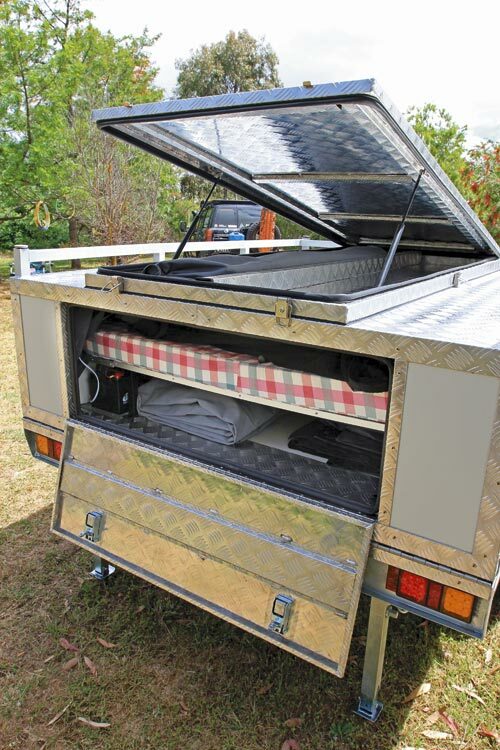 You can access internal storage with the camper closed using the rear door. 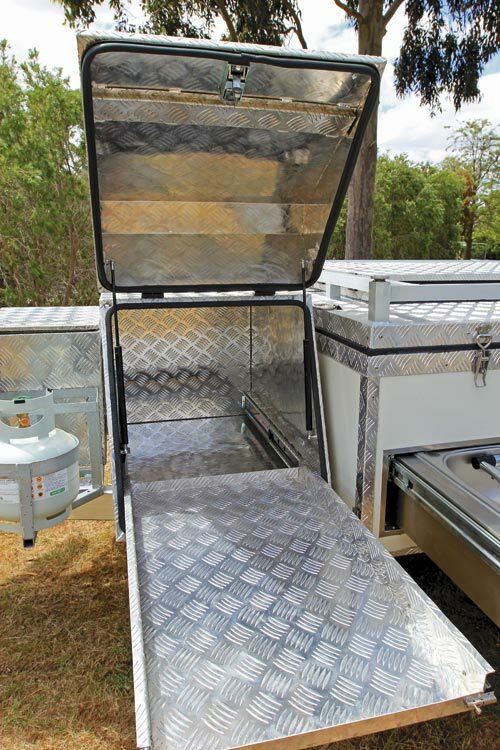 A basic slide-out stainless steel kitchen pulls from the passenger side featuring a deep sink, tap with 12V pump and a cutlery drawer. The finish isn’t as good as Australian stainless steel although it still does the job. As an introductory model, there is no stove but there is plenty of room on the bench for a portable unit. 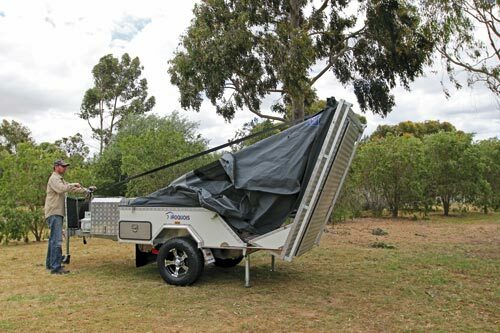 The camper setup is aided by a winch and belt system, which lowers the floor to the ground and back again at pack-up time. It does take a few extra minutes to wind out the strap rather than using a manual flip-over method, however safety is the primary goal, particularly with children, small animals and wayward adults around. There are small discs on the base of the hardfloor that wind out to massage out any levelling issues. With the floor wound down, simply climb inside the tent and begin adjusting the bows to iron out the wrinkles. The attractive-looking dual tone, grey canvas measures 14oz. A tropical roof constructed from a silver nylon material with supporting fibreglass bows fold with the tent. 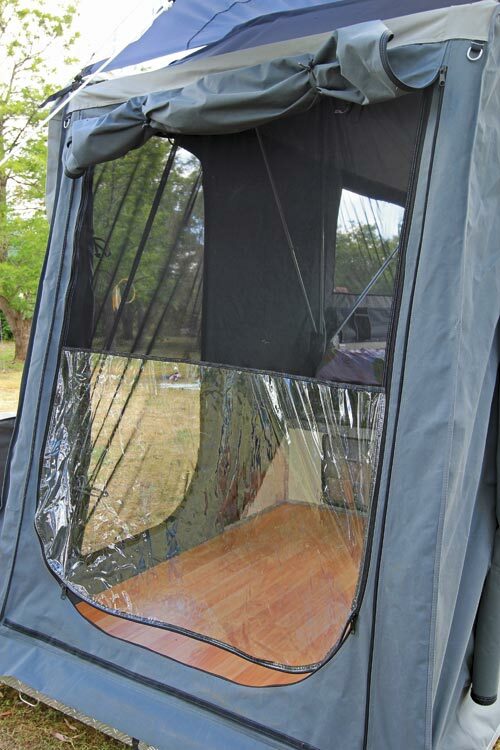 It is not as attractive as the tent canvas although I expect it is more effective in reflecting heat while maintaining a pocket of air to reduce condensation. A full annexe with drop-in floor provides an additional undercover room or you can simply make do with the awning and maybe an end wall for some additional shelter and privacy. Other windows roll from the outside, which doesn’t offer the full flexibility of other setups. 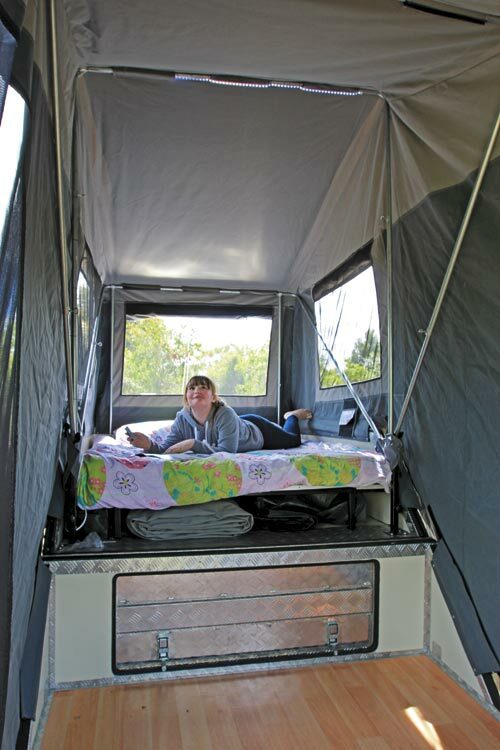 Unexpected showers at night may require a quick lap of the camper in your jimmy-jams to shut the external flaps. Insect mesh is used for all the windows, and the zips and other hardware perform as required. A basic electrical package is offered featuring a 100ah battery, 12V wiring and Anderson plug charging, LED strip lighting, isolator, and fuse distribution box with individually fused components. The only 12V socket is in the fridge box, with the LED strip lighting run direct to the battery. It is easy to fall into the trap of dismissing products based on their place of origin alone. I admit to falling foul of this practice myself, but after a day out with the Iroquois my perspectives have been realigned. 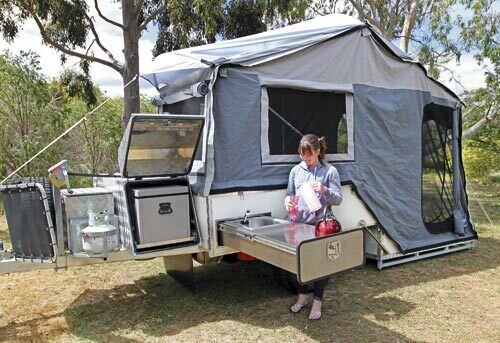 The camper seems well designed with plenty of big ticket items and well thought-out accessories, such as the high-flow water valves on the drawbar and twin water pumps, neatly tucked under the trailer. The omission of a cooker is neither here nor there. Many people up-scaling from a tent will already have a cooker. If not, a butane canister cooker will be the best $20 ever spent. Otherwise there are plenty of other dual burner gas or fuel stoves for less than a couple of hundred bucks. The Iroquois is not perfect. Some of the finishes are below what we have become accustomed to and there are some omissions. But most of these are easily rectified and for many buyers at this price point, it will do just fine. The warranty is 12 months on the trailer, with a five-year structural warranty. 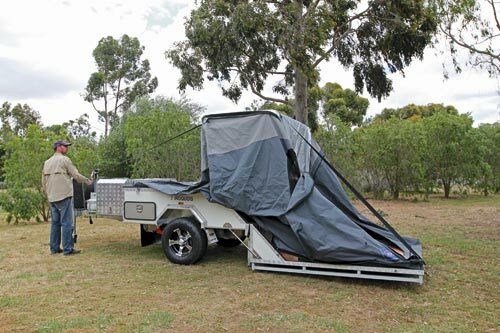 Buy and sell camper trailers online at TradeRVs.com.au.